These chicken wings are touted as “the world’s longest recipe for chicken wings” and it’s true, they aren’t the kind of chicken wings you throw together on a Wednesday night, but they are really, really good. 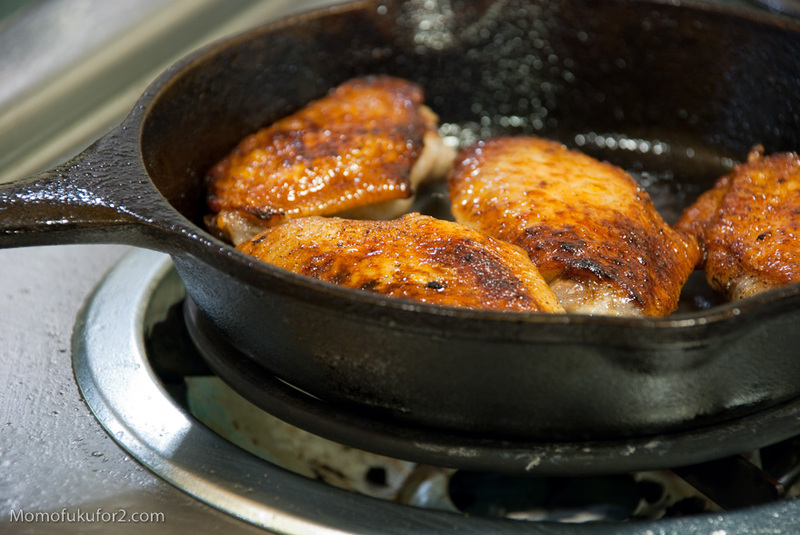 If you do most of the preparation a day or two before, actual cooking time is not that bad and totally worth it. 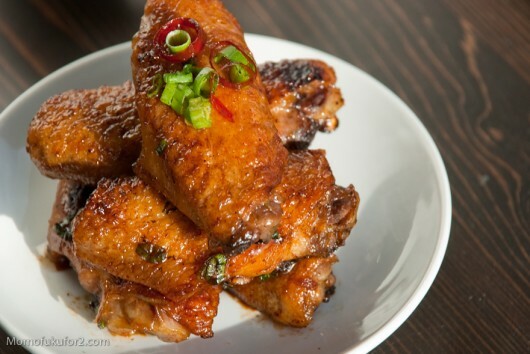 The chicken wings follow the same kind of preparation as the chicken in Momofuku’s Chicken & Egg, so if you have your chicken wings waiting for you in the fridge, you’re good to go. 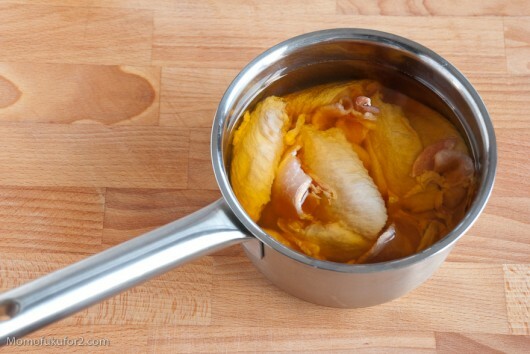 If you don’t, basically, you confit your wings and some bacon in pork fat to infuse the chicken with a rich smokiness and then let the wings chill completely in the fat. 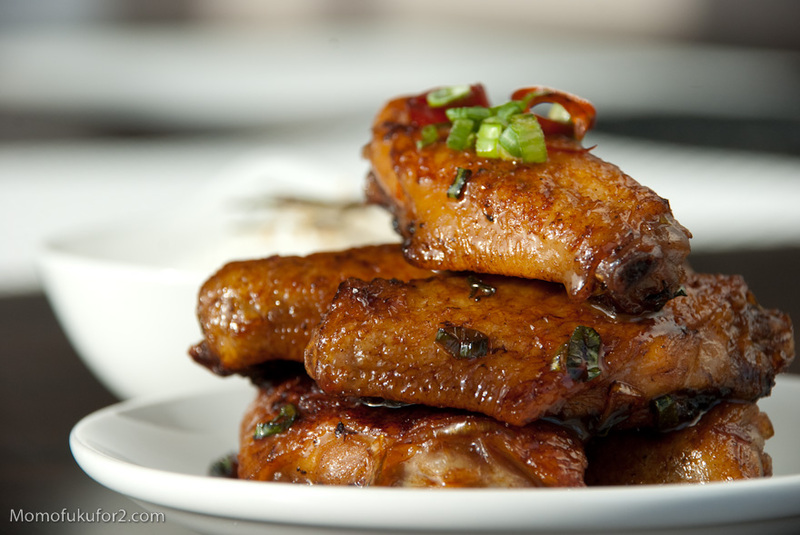 When you’re ready to eat, heat up the fat, strain out the chicken wings and pat dry. 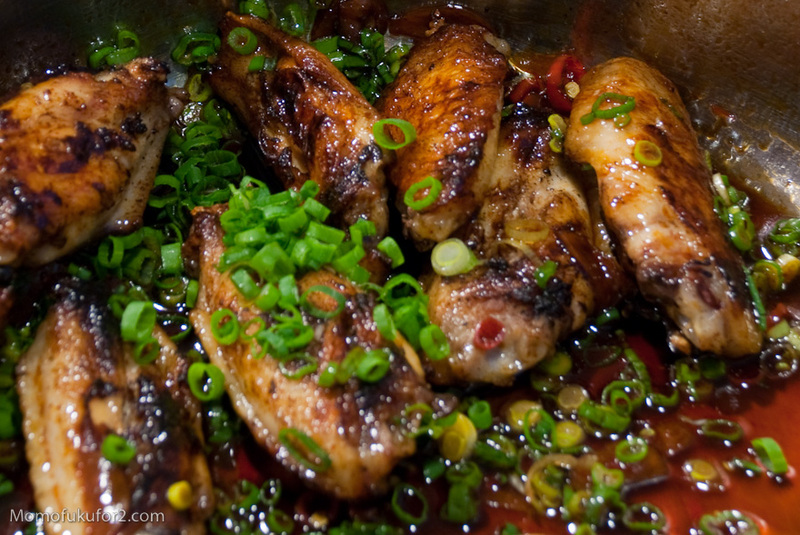 The chicken won’t look anything close to cooked, but don’t worry, then wings are then pan fried in a cast-iron skillet until deeply browned and then tossed with a sauce made with taré (luckily I had some extra in the fridge), the confit fat, sliced garlic and pickled chilies. Toss some green onions on for garnish and it’s good eats, especially with rice. Sweet, spicy, juicy and crispy, these were some good chicken wings, but what really made the wings shine was the sauce. Save any left over sauce you have because its delicious as a dipping sauce or on rice or noodles. If Momofuku is famous for one item it’s the steamed pork buns. 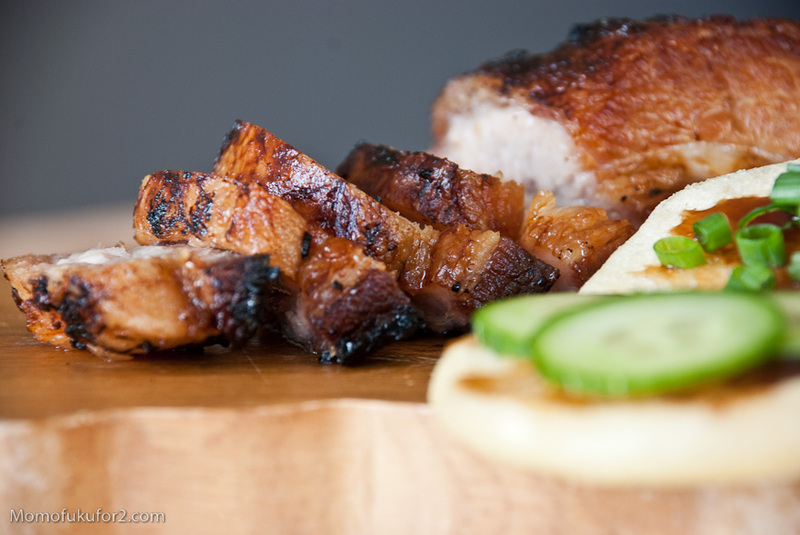 There’s been a lot of hype about the pork buns, even if they were an “eleventh-hour addition” to the menu. 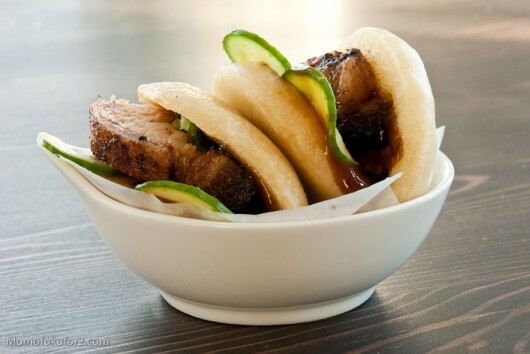 Chang himself admits that the buns are “a take on pretty common Asian food formula: steamed bread + tasty meat = good eating.” It’s true too, there are hundreds of versions of steamed buns and meats, but I have never had one as satisfying as the one I had that first time I visited Momofuku in 2007. 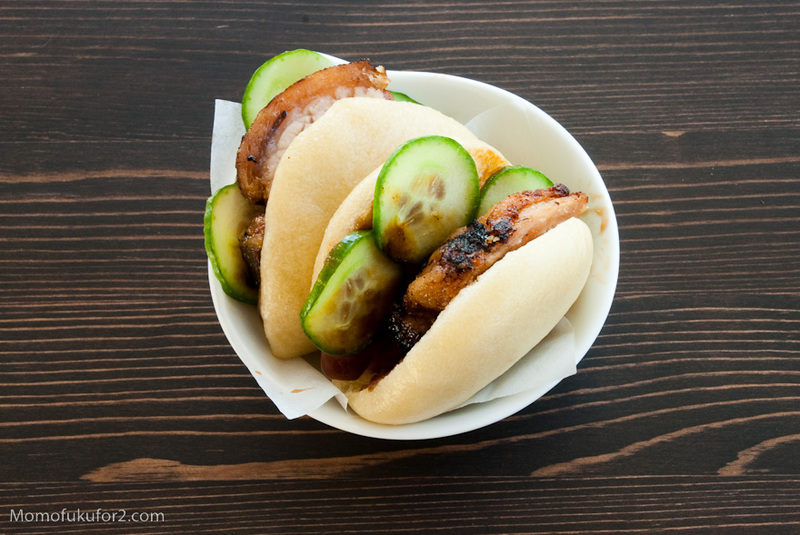 Maybe it was because I was really hungry, or maybe it was my giddiness at staying another night in NYC, but that first Momofuku pork bun was so perfect. The combination of sweet hoisin, green onions, roasted pork belly, and crunchy pickled cucumbers wrapped up in the perfect blank slate for flavour, the steamed bun, was handheld satisfaction. The buns are ridiculously addictive, simple and satisfying. The recipe in the book isn’t really a recipe at all, more a how-to-assemble, as long as you have all of your ingredients ready. 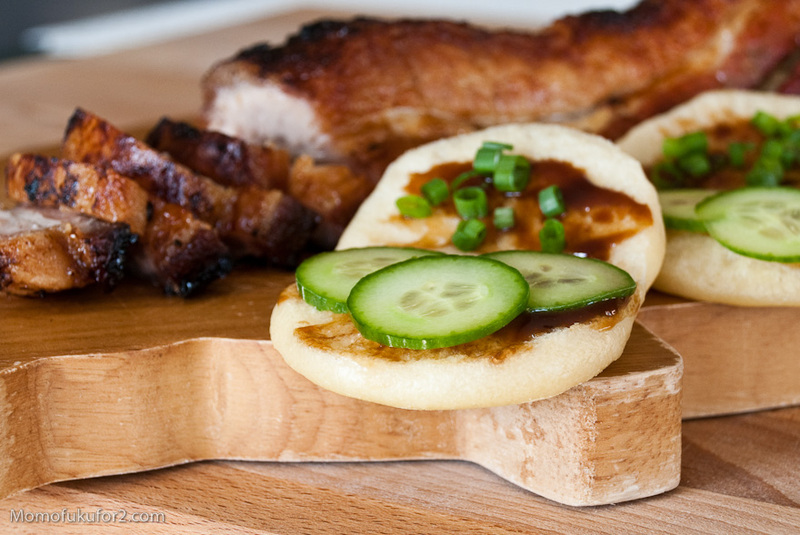 You need steamed buns, hoisin sauce, quick-pickled cucumbers, roasted pork belly, green onions and sriracha on the side. 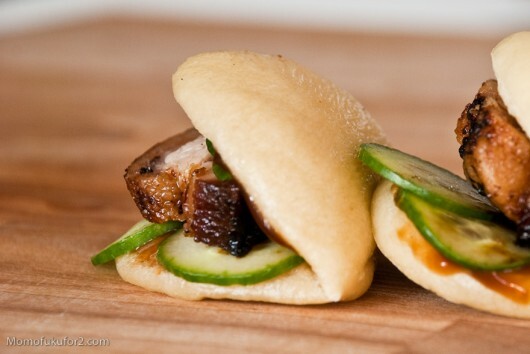 Flip open your buns, spread some hoisin on both sides, cucumbers go on the bottom half, the top half gets a sprinkling of green onions then slices of roast pork belly are nestled in the middle. Fold up the goodness and eat! 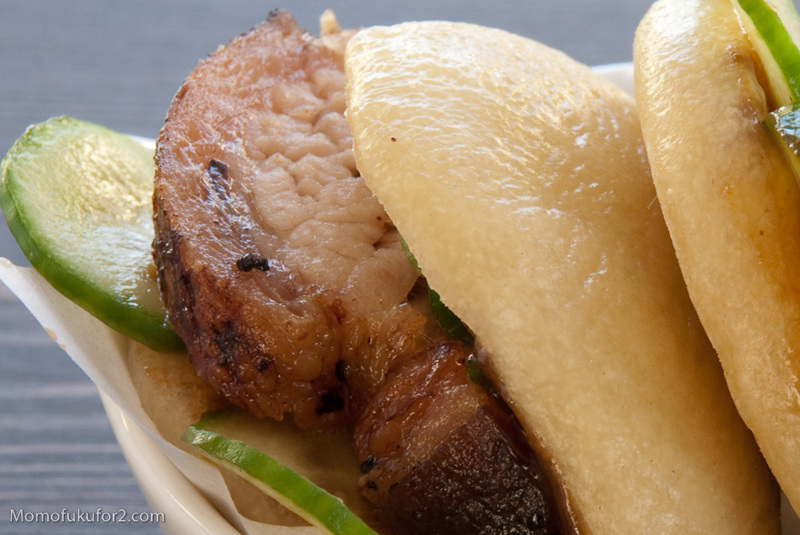 Damn you pork buns, I want to eat hundreds of you and fall into a food coma. 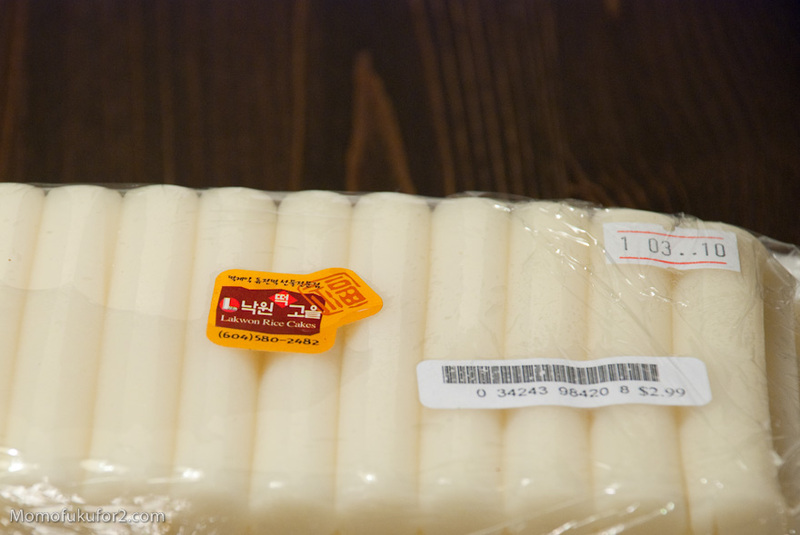 Rice cakes are gelatinous, chewy, and a bit of an acquired taste, but mostly an acquired texture. Rice cakes don’t have a lot of flavour on their own since they are made from rice. 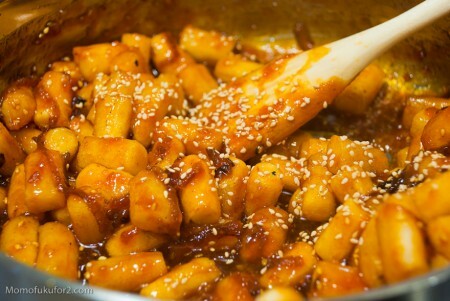 Usually Korean rice cakes are found in soups or in dok boki, a Classic Korean dish that tosses boiled rice cakes with a red spicy sauce. 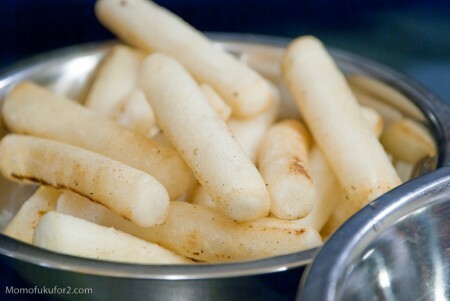 I’ve had dok boki in Korean restaurants before, and even though I like the chewy rice cake texture, eating more than one or two of them isn’t really my thing. After a while they start to feel too heavy, too gelatinous. I think it’s the monotony of the texture of the dish; there are no real contrasts. 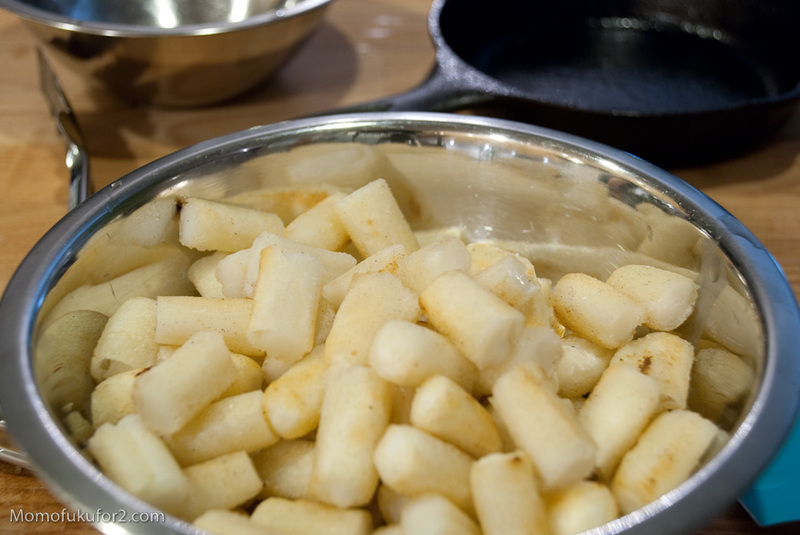 Roasted rice cakes are different because of the roasting. 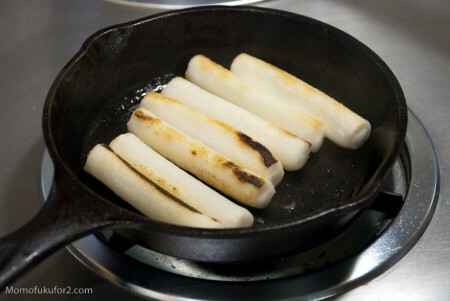 Roasting them in oil in a cast iron skillet crisps up the rice cake giving it a toasty, crunchy outside and a soft, chewy inside. 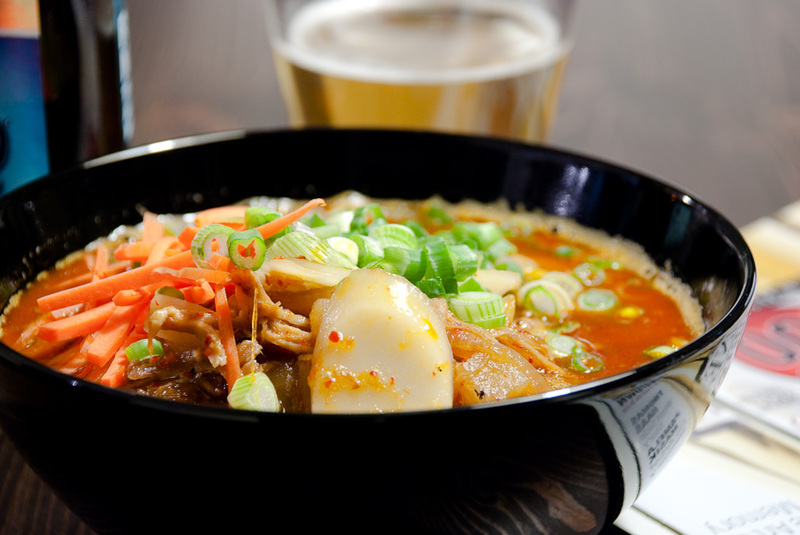 It’s an addictive combination and much better than boiled. Mike and I tried some of the roasted cakes right out of the pan and they were delicious just like that. The cakes were delicious plain, but they were even better when you tossed them in that signature red sauce. 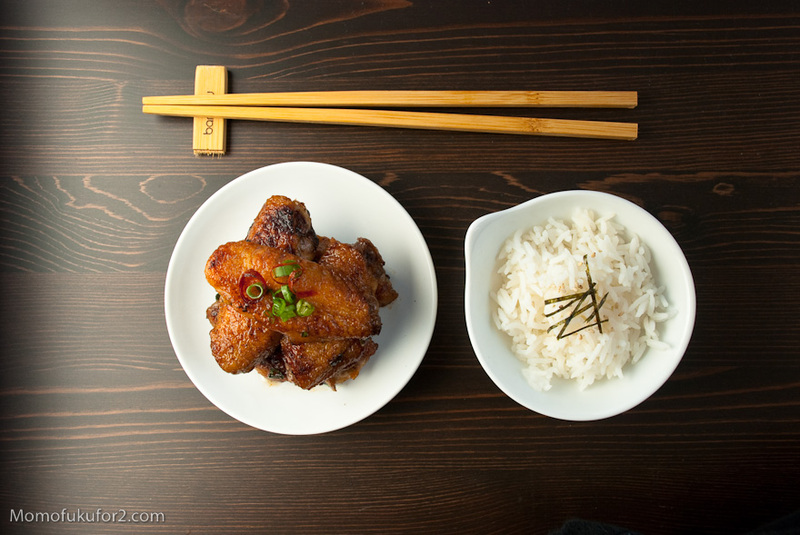 Chang’s sauce is made up of Korean Red Dragon sauce, roasted onions, mirin, and ramen broth. Sweet and spicy, crisp and chewy, this dish is answers all my complaints about the monotony of dok boki. 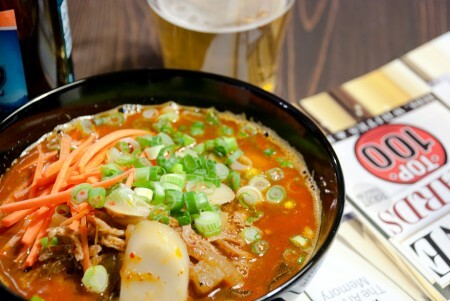 If my version is this good, I’m definitely ordering this when I visit Noodle Bar again! Note: Rice cakes are called mochi in Japanese and they do an awesome grilled mochi of their own: isobe maki mochi. 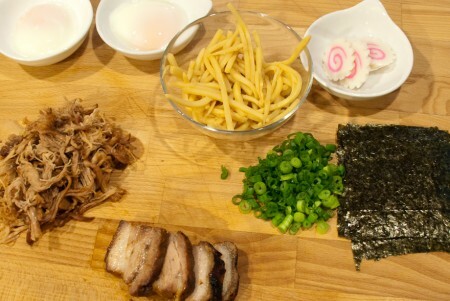 Mochi is grilled until puffy and golden brown, wrapped up in seaweed and drizzled with shoyu. It’s quick and tasty, if you don’t have time to make all the Momofuku sauces. Many of the recipes in the Momofuku cookbook have recipes within recipes and the Kimchi Stew is no exception. I’m not complaining, I think it’s actually kind of fun to fit all the pieces together. Putting the pieces of the Kimchi Stew together is fast, if you have all the right ingredients on hand. This stew is like no other stew. The ingredients are pre-cooked and there isn’t an absurd multi-hour stewing process. 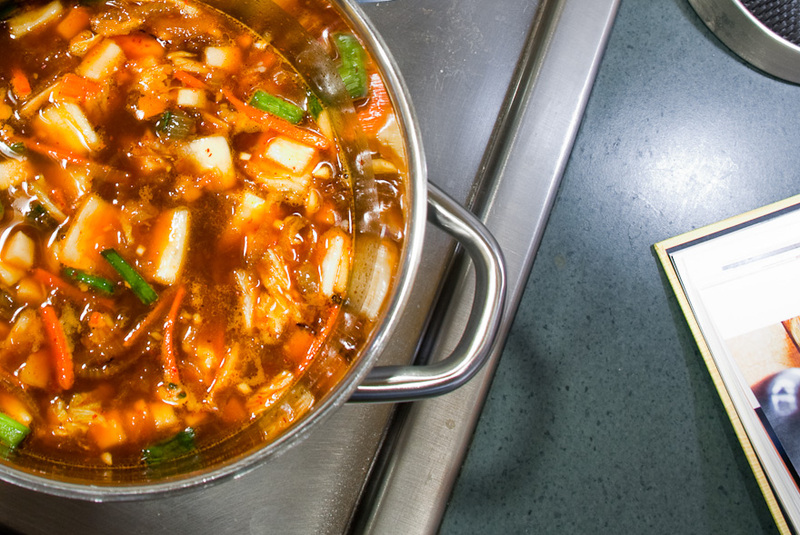 You do simmer for a while for the flavours to meld together, but by no means do you stew. 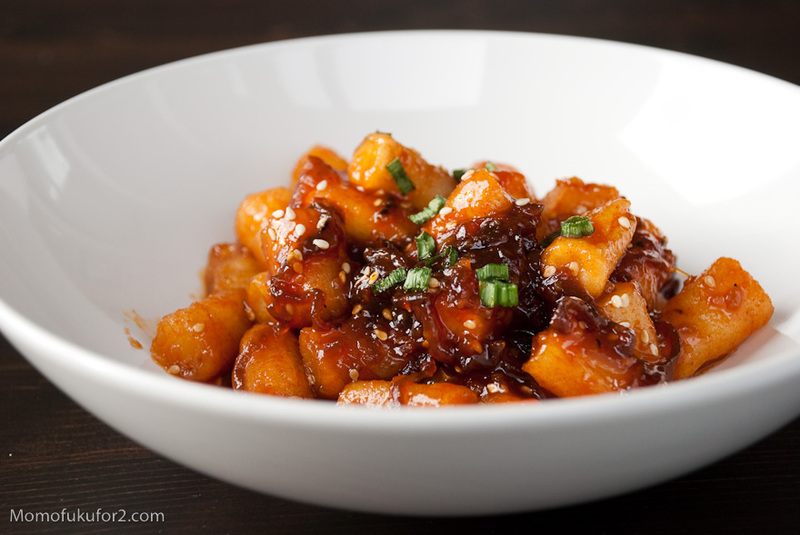 I was a little worried because I’m not the biggest kimchi fan, but this stew converted me. It doesn’t have an overwhelming kimchi flavour, due to the mirin. The mirin tempered the sourness of the kimchi and the resulting flavour was sweet and slow-burn spicy. The texture of the quickly stewed kimchi was perfect: the napa cabbage and daikon had that pickled kimchi flavour and were melty and yielding. 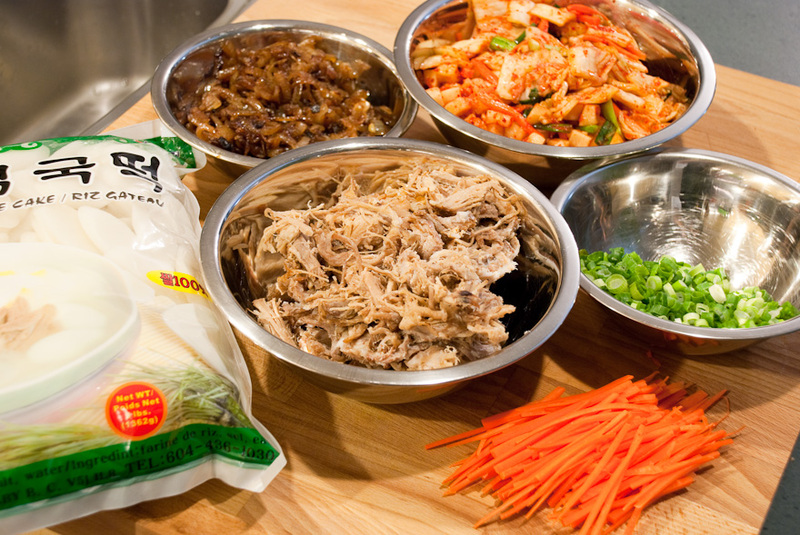 The smokiness of the soft pulled pork was contrasted with the crunchy green onions and carrot garnish. The rice cakes were gelatinous goodness. so nice we took the photo twice! This is a stew you want to eat with rice. 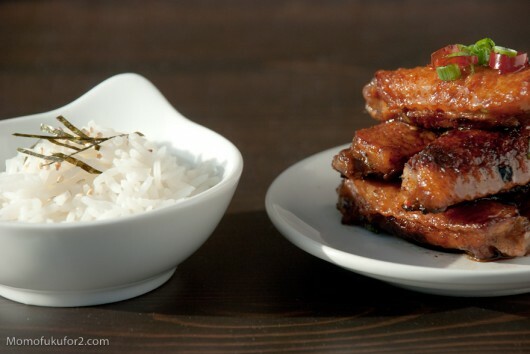 It’s hearty and filling on its own, but it’s even better with rice. Sometimes you just need that plain accompaniment to compliment the flavours even more. There’s something so comforting about a savoury dish with plain. 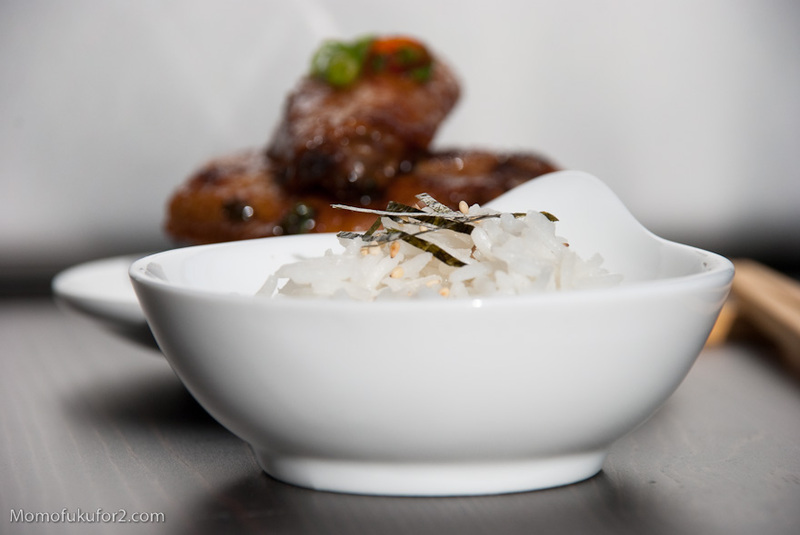 sticky, short-grain rice. It’s a cozy, warming, feel-good meal. I’m definitely making it again. 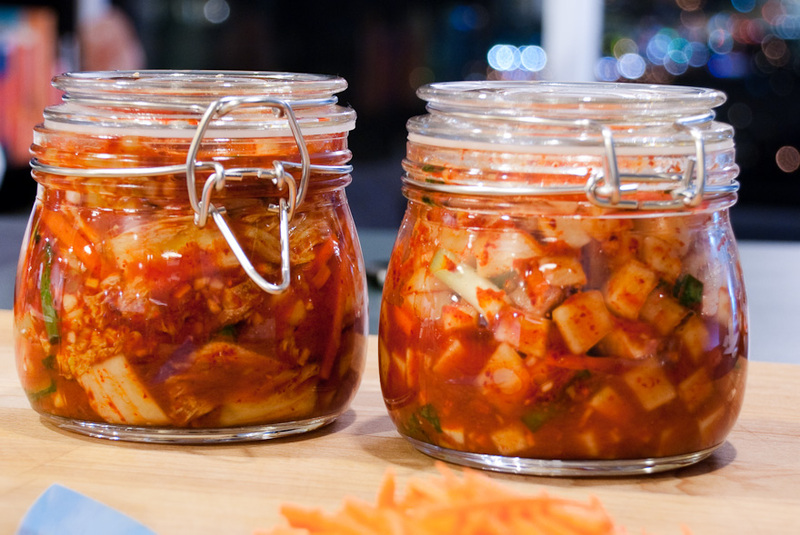 Kimchi, I was wrong about you, I’m so glad you’re in my life. 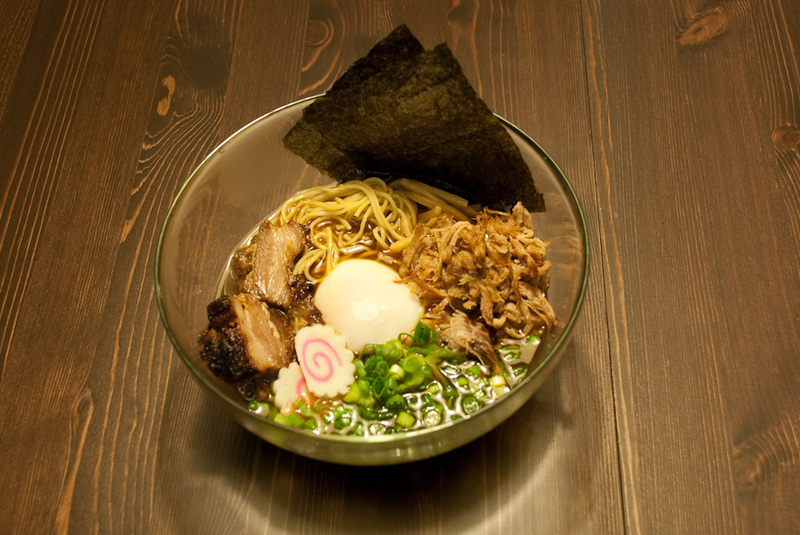 Ok, I’ll admit, making Momofuku Ramen didn’t take weeks, or days. It really only took one day. 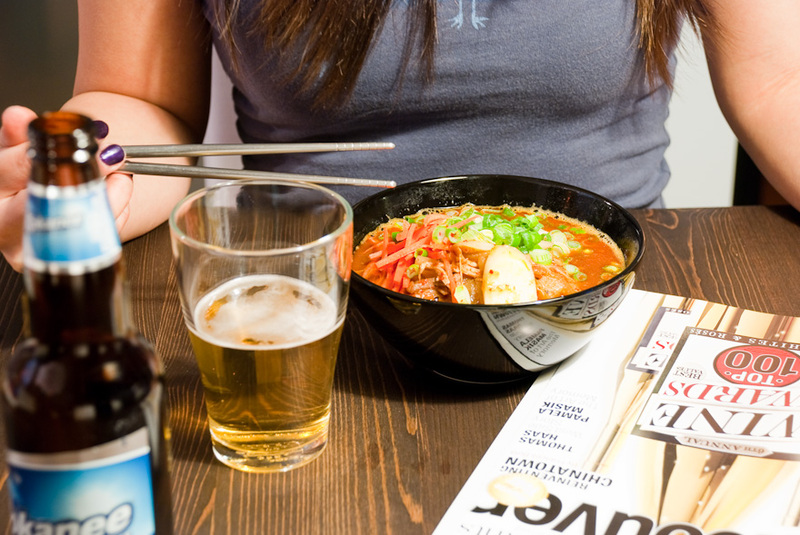 I started just before noon and we were sitting down to steaming bowls of noodles by midnight. We had some hunger-staving snacks in between. 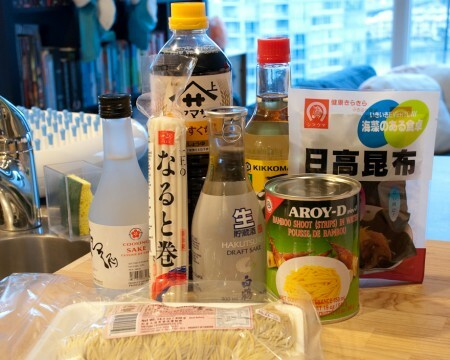 Don’t make these noodles if you’re hungry, in a hurry, or expecting to eat anytime soon. They are a time investment, but it’s a sure thing. One thing I didn’t make were the actual ramen noodles. Next time I’ll add 2 hours to the schedule and give them a whirl. I was really impressed with the fresh ramen noodles that I bought at T&T. I was a little skeptical, but they were chewy with a great bite. I was also concerned with the bamboo shoots. First of all, we bought the wrong kind. The recipe calls for sliced shoots, but we bought strips. Second, Mike and I don’t actually like bamboo shoots. I find their flavour off-putting, or at least I used to. 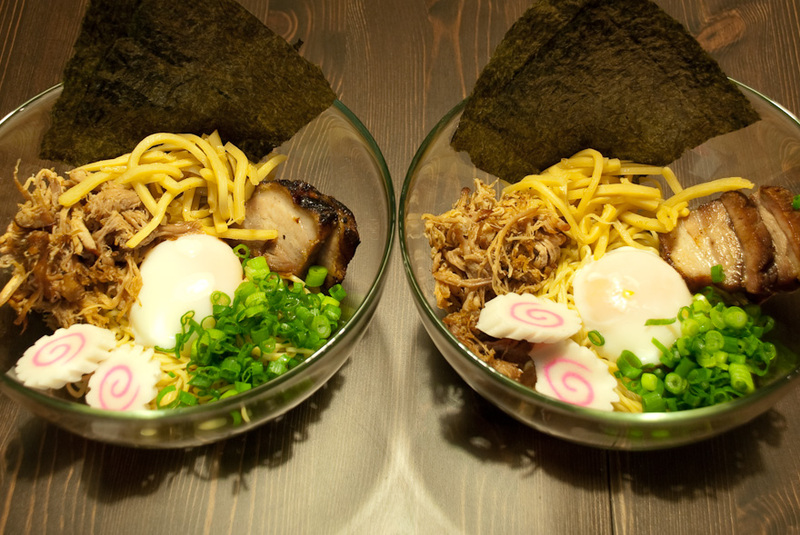 Maybe it had something to do with the shoots being strips instead of slices or maybe its because of Chang’s recipe for cooking them, but the bamboo was an awesome addition to the ramen. It added textural contrast with a subtle crunch. Once you have all your components in place, putting together the ramen bowl is super easy. Noodles, broth, pork belly, pork shoulder, nori, green onions, fish cake, bamboo shoots, poached egg, done! The verdict? Maybe it was the anticipation, but these noodles were good. Really, really good. The broth was deep and flavourful, the meats tasty and the egg rich and creamy. My stomach did the happy dance.